Aki Sasamoto’s installations and performances explore the underlying strangeness and nuances of everyday life. She uses sculpture, movement, video, and sound to transform mundane actions into theatrical events. As an integral part of her practice she often collaborates with others, including artists, musicians, choreographers, mathematicians and scholars, and she co-founded Culture Push, a New York-based non-profit arts organization, to enable diverse professionals to meet through artist-led projects and cross-disciplinary symposia. Her performance works revolve around everyday gestures. She has described these carefully prepared improvisations as an escape from “thiis world (the everyday, banal relationships, and talking)” into “thaat world (productions, improvisation, and introspective thinking)”, like being transported into a parallel universe. “I use judgments, generalizations, and fictions, all crafted as close as possible to my experiences, to draw out personalized opinions and theories on nothing and everything. I want to create something that seems borderline real or general but simultaneously completely introverted and sealed up in my dreams.” Her installations are similarly dream-like, and theatrical, using careful arrangements of sculpturally altered found objects from everyday life. The constructed stories seem personal at first, yet oddly resistant and alien, open to variable degrees of access, empathy and reflection. 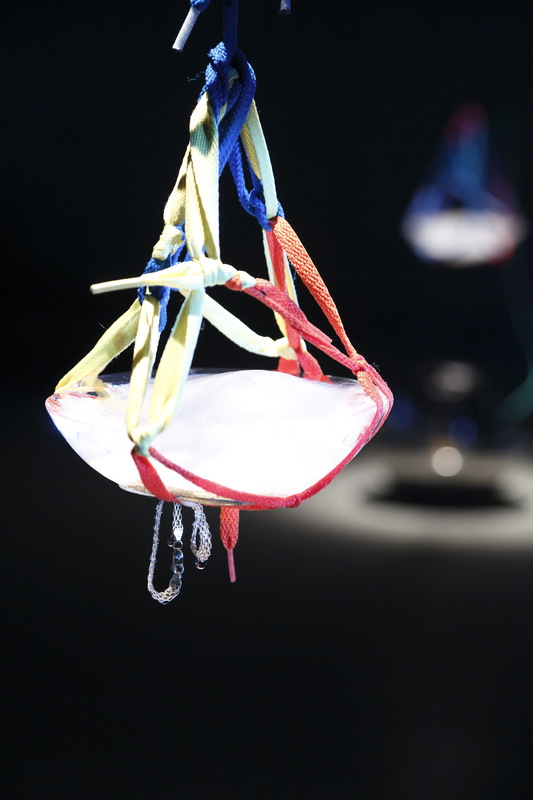 For Take Me To The River, she created a new site-specific sound installation in the basement storage area of the Forum, as development on from her Centrifugal series of works, entitled Talking in Circles in Talking, using ice, found objects and personal memorabilia. Eight round blocks of ice, of different sizes, were suspended from the ceiling by strings of multi-coloured shoe laces, knotted together. As each block gradually melted, drops of water dripped onto an up-turned stainless steel bowl, sitting on top of another larger bowl, with a pick-up inside, so that the sound was amplified through the space, treated with a delay which gave it a strange echoing resonance. Contained within each block of ice was a different set of personal mementos; bracelets, rings, spectacles, house keys, wrist watches, even a couple of CDs; each item what one might term a’ keepsake’, evoking memories of a particular person, or event, with whom the object is associated. Yet we do not know the person, or event, and so our urge for empathy is suspended. The personal meaning, embodied in the object, remains obscure. As time ticked away, marked by the treated repetitions of the dripping ice, these anonymous memorabilia gradually emerged from their frozen preserves, dangling awkwardly for a while until finally released, with a violent crash, onto the amplified bowl below. As the drama slowly unfolded, in the theatrically lit intensity of the basement storage area, the sound was simultaneously transmitted upstairs, into the covered public walkway outside the Forum entrance, providing a sparse, eery soundtrack of echoing drips to accompany the steady flow of pedestrians going about their daily routines. This entry was posted in Projects, Writings and tagged Aki Sasamoto, Dojima River Biennale 2015. Bookmark the permalink.